- Our product range starts from 15 rs. to 400 rs. per kg and it will be vary as per product specification. We are offering Corn Starch to our clients. We specialize in offering a wide assortment of Modified Tapioca Starch (Industrial Grade), which is used in textile sizing and modified starch industries as a binder. It is formulated using premium quality ingredients and free from any kind of impurity. To meet the precise requirements of our customers, we are into presenting an enormous quality range of Maize Starch Powder to our clients. This Maize Starch Powder is widely used in textile, food, pharmaceutical and paper industries. Besides, these products are available as per the client’s requirements. 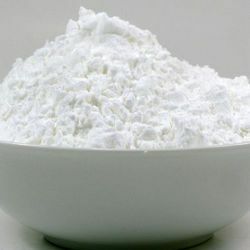 The Maize Starch, offered by us is a fine white color powder, which is insoluble in water & alcohol. The starch powder is a mixture of polysaccharides containing about 75 to 80% Amylopectin & 20 to 25% Amylose. Tapioca Starch is obtained from root called "Tapioca". It carries high viscosity and can be modified to suit by physical changing or chemically treating and modifying its characteristic with respect to its strength, binding characters in different industries as per its need.